Situated in a rural location, this guesthouse is within 12 mi (20 km) of Aussichtsturm Josephskreuz, Hexentanzplatz, and Pullman City Harz. Museum Kleines Bürgerhaus and Ancient Coin Museum are also within 12 mi (20 km). 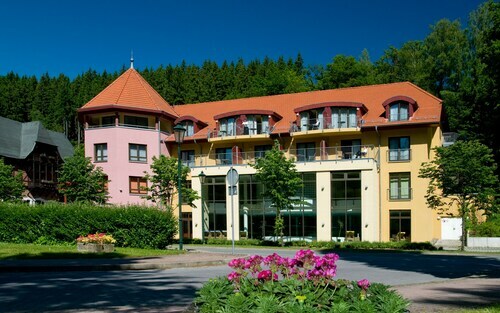 Situated in Harzgerode, this spa hotel is within 12 mi (20 km) of Aussichtsturm Josephskreuz, South Harz Nature Park, and Museum Kleines Bürgerhaus. Ancient Coin Museum and Schloss Stolberg are also within 12 mi (20 km). Situated in Harzgerode, this spa hotel is within 12 mi (20 km) of Aussichtsturm Josephskreuz, Museum Kleines Bürgerhaus, and Quedlinburg Castle. Quedlinburg Cathedral is 12.4 mi (20 km) away. Situated in Harzgerode, this vacation home is within 12 mi (20 km) of Aussichtsturm Josephskreuz, Museum Kleines Bürgerhaus, and Ancient Coin Museum. Schloss Stolberg is 12.2 mi (19.7 km) away. How Much is a Hotel Room in Harzgerode? Hotels in Harzgerode start at $48 per night. Prices and availability subject to change. Additional terms may apply. Thinking about taking that trip to Harz? To experience it as the locals do, reserve places to stay which are within a short drive from downtown Harzgerode. There are 4 hotels, apartments and other accommodation options on Travelocity located within 6-mile (10-kilometer) of the center of Harzgerode. The Hotel Habichtstein Alexisbad is amongst the most conveniently located options, one of just a small number of choices within an easy walk of the Harzgerode downtown area. Investigate the Best Western Hotel Schlossmuehle and the Wyndham Garden Quedlinburg Stadtschloss. The Best Western Hotel Schlossmuehle can be found just 9 miles (15 kilometers) outside of the middle of Harzgerode. The Wyndham Garden Quedlinburg Stadtschloss, is 10 miles (15 kilometers) away. Some other accommodation options are the Schlosshotel Blankenburg/Harz and the Parkhotel Unter den Linden. Following your exploration in Harzgerode, make sure you explore Saxony-Anhalt's other scenic and cultural delights. Photograph the scenery of Saxony-Anhalt's forests. While you're at it, explore many of its castles. Wise visitors in this pocket of Germany adore snowboarding. Looking for things to do? Spend a few hours visiting Goslar Imperial Palace and Mines of Rammelsberg, which can be found in Goslar, 35 miles (57 kilometers) to the northwest of Harzgerode. A few Travelocity-listed Goslar places to base yourself include the Altstadt Hotel Gosequell and RAMADA Hotel Baeren Goslar. Or, you could stay in Sorge, 19 miles (31 kilometers) west of Harzgerode, where you can choose between the Hotel Tannenpark and Landhausferienwohnungen Am Brockenblick. When you visit Sorge, make sure you venture to the Grenzlandschaft and Museum Sorge and Ring der Erinnerung. If you are really into sports and enjoy attending games ensure you get to Red Bull Arena, situated 55 miles (91 kilometers) to the east of Harzgerode. Anybody that hope to find Travelocity-listed hotels in the area around the stadium can explore the Steigenberger Grandhotel Handelshof Leipzig or the Radisson Blu Hotel, Leipzig. Located 45 miles (76 kilometers) away from the heart of Harzgerode is Erfurt Airport. Find accommodation nearby at Airport Hotel Erfurt or Hotel & Restaurant Park-Cafe ISA.